It would be really nice if they have a whole Avatar Saga release, all episodes from AtLa and LoK. I wouldn't be able to buy it (thanks to my country) but it still would be epic as hell. I would snag that up on Blu-ray ASAP if they made it. I don't think it will happen anytime soon though. Even a saga release on DVD seems unlikely. In terms of sales, I expect there to be a boost for the Book Balance set, if just because of the people who will buy it to support the representation, whatever their feelings about the rest of the show. Myself, I've been meaning to get Book Spirits for the Beginnings episodes, and I genuinely wanted the Book Change set to rewatch the whole story, but I was disappointed enough in Book Balance that I'm not sure I just want to own the middle of the story, at this point. I think whether I end up owning any LoK discs is going to come down to whether an attractive full-series set is released. I don't know about that in terms of sales going up all of people myself included are not going to but the DVD because of the Korrasami ending for religious reasons like Christians, Mormons etc and people who are unhappy for narrative reasons since Korrasami makes no sense and let's not forget the Hetreo Lense comments that made people angry. It you look at the comments on Facebook YouTube, IGN half if not the majority of the comments are against the ending and many people are saying they are done with the show are these people going to buy the DVD. Most of the people who only care representation are not long term fans of the show and won't buy the DVDS simply because they will more on to their next cause and if Nick loses enough money Korrasami could be throw out remember Viacon owns Avatar not Bryke so they have the final say on the Franchise. keep our money unless this mistake is corrected. have always been against Legend of Korra, regardless of season or episode, this isn't a good argument, rather weak. Also, on Facebook, the amount of likes on Korrasami pictures is far, far greater than the amount of comments and half of those comments are people supporting the ending. I realized I was being way too negative when I said the sales would go down. It won't. Lastly if you didn't like the ending boycotting is you way as a fan to voice you disapproval why reward bad narrative and being insulted if we can influence the future of this franchises why not keep our money unless this mistake is corrected. Because I refuse to punish the makers of the show by trying to hurt dvd sales just because they made one misguided mistake. 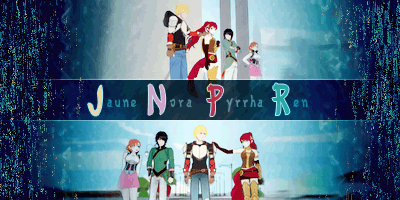 As much as I hate the last two minutes, I love the rest of the series. I'd be out of my mind if I didn't buy the blu-ray just because of that. Not all Christians boycott everything with gay people in it. Let's not divert off into other topics in this thread. Let's keep it to discussion of the DVDs and Blu-Ray, etc. So far they've only watched the first episode, I think. The most interesting info is that we were originally supposed to meet Izumi's daughter, who would be Mako's love interest. ^Wow. So the brothers were going to hook up with princesses (Opal is kind of like one since her mother founded the city). It's a shame that we will never see that sister unless they do comics. There's also more I've seen in their twitter I like to add. -Wu as studying at the University of RC and was a distant relative of the Queen that was way down on the chain of succession . Good to know that he was at least getting an education. -The Metal Clan were originally going to be evil all along, leading them to be the villains for Book 4. I'll add more if I see any. @lKingChris Wasn't that. They wanted to stay away from relationship building in Book 4 and focus more on friendship. I really hope Bryke didn't say that in the commentary, because I didn't even see a good focus on friendship. Everyone was everywhere to focus on friendship. ^ Yeah, they were kind of scattered around too much to really focus on their friendship. I think the nature of Book 4 in general was more or less about Korra learning to balance herself when confronted with someone like Kuvira. The progression of the story itself kind of didn't really allow for many friendship moments. Although I will I say I think this is just down to season length. Having a extra episode, say, when Bolin and Opal came back from rescuing her family and Korra was fresh off of confronting Zaheer would have been a nice breather episode, and could have offered a little screentime on Kuvira as well. I like how this person tweeted pics of how amazing the episodes look on blu-ray...except this person took camera phone pics straight off the TV screen lol. Focus more on friendship? I'm sorry but that didn't even really happen in season 4. I'm not saying Korra shouldn't have had her PTSD storyline, but they needed to have the group be together since it was the final season and they pretty much lost an episode. I'm also happy that they didn't bring in Izumi's daughter as Mako's love interest, that would've been overkill in my opinion. Mako was already with an heiress to a vast fortune as well as the Avatar. He didn't need another high profile girlfriend. ^ As I said, I'm not sure if that was the twitter user's OWN statement, or something he was mentioning regards to what Bryke said in the commentary. I seriously can't believe Bryke would say something like that, so I'm going with the former. Moved and merged with the Book 4 DVD/blu-ray thread. There is something a little odd about the wording in his tweet about Prince Wu being way down on the line of succession. To be far down the line that would mean there were others before him that were supposed to get the throne, so if he wasn't the immediate successor (as the queen presumably had no children) who else was supposed to get the throne? While the Metal clan didn't become evil, they definitely were apathetic and selfish in the end except for those who had initially went with Kuvira with good intentions. Seriously locking up their little utopia as the continent crumbled around them and people resorted to looting from those who didn't have much to spare. I had little to no sympathy for Su when she lost Zaofu. ^ They could have fled the Earth Kingdom, been captured by warlords, or just refused to become heir due to the danger involved. It definitely seemed like they were scraping the bottom of the barrel for heirs when they introduced Wu at the beginning of Book 4. I still don't get the reasoning for how or why Su needed to save the entire country by herself - but none of the other kingdoms/countries/whatever were obligated to help. It's like expecting Rhode Island to support the entire North American continent because reasons... incredibly vague reasons. Then again I do love me some zombie media, and the first rule of zombie media is that it's all about getting you and some close friends/allies/family in a secure location... and bump everyone else. So I might be coming at this from a different position. I think the reasoning was pretty justified for why Su had to be the one. It's fairly evident that Zaofu is a powerful and technologically advanced state in the Earth Kingdom and is incredibly stable and influential due to being established and led by a noble family like the Beifongs. I don't think they literally expected Su to save the entire country by herself. What they intended was for her to essentially lead Zaofu's forces in securing the Earth Kingdom and bringing back stability, which as shown with Kuvira's forces was exactly what was needed. The thing is that Su didn't think of what could happen in the long term. If it wasn't Kuvira, it would've just been some other warlord trying to take Zaofu or several desperate people who have lost much since the Earth Kingdom had fallen and no central government to handle anything. Her city was wealthy and far more technologically advanced than any other city shown so far, plus her security forces were said to be some of the best metalbenders in the world. She may not have been obligated, but she could've done something. I can only imagine how snarky President Raiko would be towards Su when she requested some troops to help defend Zaofu. Just got my copy of Book 4 Balance Blu-ray in the mail from Best-Buy. Did anyone know that this set was including a mini-poster? Just curious if this was a known bonus or a surprise for fans. That was a pleasant surprise to me as well. I didn't here about it beforehand either. I think it's just a cool bonus. 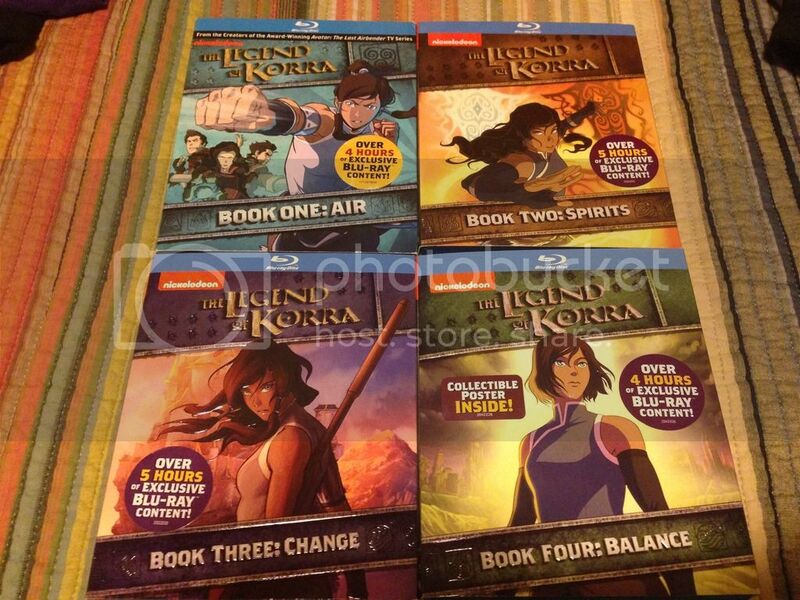 I'm seriously still amazed that Nickelodeon even released Korra on Blu-ray, let alone all four books. It allows me to hold onto a shred of hope that ATLA will eventually get the same treatment. I didn't notice it before now, but I think it's entirely appropriate that the Krew only appears on the first book's cover. They're like ugly singers with amazing voices (except Asami who is gorgeous but talent-less) best for back-up. And on that cover they are all the way in the back... It's weird tho' because Korra honestly got less focus in a lot of ways as the series progressed... Oh well. 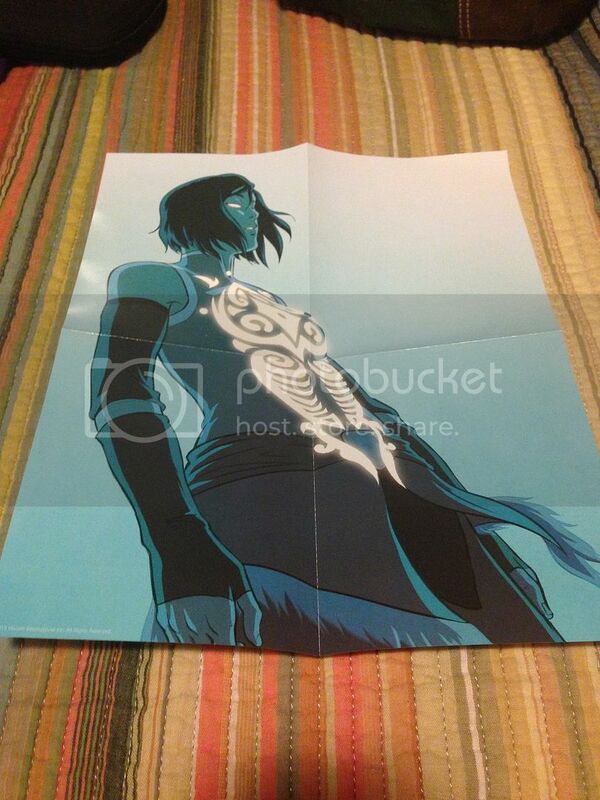 Korra was created to be displayed at 1080p with a 16:9 aspect ratio. Making a Blu-ray transfer probably took less effort than the DVD one. A:tLA, on the other hand, was created for 480i with a 4:3 aspect ratio. There simply isn't enough information to allow for an HD transfer -- a Blu-ray version would offer nothing more than the ability to put more episodes on a disc (and, I suppose, less of the artifacts that exist on the current DVD transfer, if they went back and made the transfer from the original tapes).